So, on Monday it was my birthday! I'm now 27~ What joy is mine. But, I actually had a really nice day! I had to work and David had the day off. I usually get to work for about 9:35am that was I have a bit of time to do the morning setup before preschool starts. When I got there on Monday, I called out my usual 'good morning' to everyone and they all replied with a really sneaky sounding 'good morning' back. Then I heard the Birthday song we play for the kids playing and they all sang happy birthday to me! It was so sweet! And then, to top it all off, they brought out a cake for me! 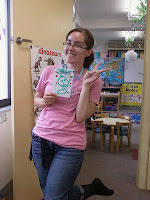 I was so touched~! And I think if I smiled anymore my face would have split in half. Hahaha. It was so, so sweet! David and I had made plans to meet up in Sendai after I was finished work. For dinner I wanted to go to Sweets Paradise. It's a really popular cake buffet! They have some pastas and soup, but it's mainly a cake heaven. Sooo much cake! And it's pretty reasonable~ 1,480yen for 80mins. We had a nice time. When we got there it was pretty empty, but about half an hour later it was starting to get quite busy. At that point we were both pretty full~ I was nursing a cocoa and David was just sipping some water, so we decided to vacate so it would free up a table for those waiting. During dinner, David brought out a card that arrived in the mail. I got my card from Gramma and Papa exactly on my birthday! Good timing, Gramma! :D It had one of the new fangled $20 bills in it. They feel sooo weird! It was kinda neat! And then David handed me his gift: A Starbucks card. Ahhh~ The gift that keeps on giving! Thanks sweetie! We walked around the Parco building since we were already there and popped into a few stores before we decided to head home. Sweets Paradise is on the 8th floor, so I snapped a couple pics of the view. I put the card to good use and grabbed a drink from our local Bux on the way home. The barista who took my order was the one who sold David the card, so she wished me a happy birthday, too. Heehee~ I felt so damn special on Monday. So, on Tuesday David and I were reeeeally craving pizza. We ended up going to the pizza and pasta place we like in Aeon for dinner. They make really good pizza and the pasta is really nice, too. So nice that I never remember to take photos. Oops. The pizza was mushroom, bacon and veg. It looked shiny, but it wasn't greasy. I think the mushrooms were a little damp when they were added, so that might explain it. We popped into the grocery store on the way home and I stumbled upon the Pocky flavours for the season. Tropical and Coconut Pocky~ I think I'll pass, thanks. They also had Rare Cheesecake Pocky, but I passed on that, too. When we got home there was a package waiting in our little mail slot. My package from Mum! Only a day late~ Not too shabby for Canada Post! There was a really sweet card and letter inside. Mum opted to buy me some necessities (i.e. underwear), hence the lack of photos of the actual gift. But still, thanks mum! Wednesdays I do Mommy and Me classes, so I get to sleep in a bit before going to work. However, on this past Wednesday I didn't get a chance to sleep because I had to dash to the post office before work. I bought tickets to see Wicked in August and they had been mailed. However, since no one was home to actually receive them they held them at the post office. I got there bright and early, thinking it might be a bit busy. Nope. Dead. So, I was in and out in less than 5 minutes. I ended up going to Starbucks for breakfast. I started the Lord of the Rings recently, so I ate breakfast and read until it was time to catch my train. After class we had a meeting for our summer school event. Ai-sensei came in and she brought her daughter, Yuka, with her. Yuka is soooo freaking cute! She only comes to school 1 day a week, but I adore her. She's such a good girl and she speaks English very well for her age. And when they came in, Yuka gave me a hug then handed me a bag and said 'Happy Birthday!' to me! 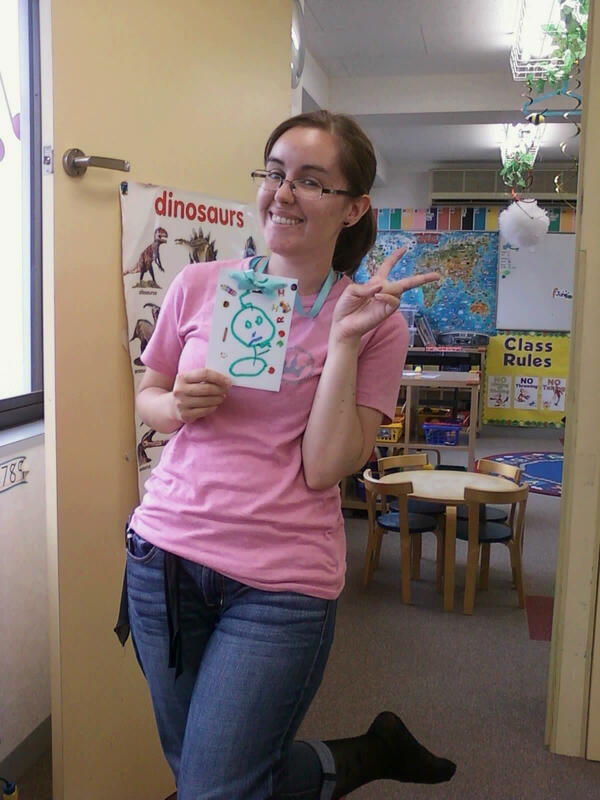 Ai-sensei and Yuka made me a card and gave me some candy! Awww! Yesterday I had a half day and David got out of work early. We decided to go on a date, since we haven't gone on a 'real' date in aaages. And by 'real' I mean dinner, some form of entertainment and purikura. So, we went and got curry from CoCo Ichiban for dinner. I ended up getting the Sasami chicken curry. I guess Sasami chicken is really good quality. And it tasted that way. It was freaking delicioius! After dinner we popped over to the local karaoke place. We'd never gone in before, because we assumed it'd be really expensive. It really wasn't! We got an hour of time and drink bar for 500yen each. That, my friends, is CHEEEEEAP!! It was really fun, too. David is hilarious at karaoke. We sang Make a Man Out of You from Mulan to start, then we just went crazy. It was a lot of fun! I also found Synchronicity~ Part 2 and sang my part while muddling through Angel's. I love singing it, but it's not as fun without her. After our hour was finished, we sauntered over to Sega World. There weren't really any prizes we wanted. The only one I was considering was the Evangelion frying pan, but the game looked too hard, so I passed. We did do purikura~ And it was fun like always. David really good at the decorating part and he's such a dweeb when we do the poses. Hahaha. It was a fun date! I still say it tastes like it should be yellow.